It’s been worse … a lot worse. Before 1900, the following droughts are commemorated on the stone: 1417, 1616, 1707, 1746, 1790, 1800, 1811, 1830, 1842, 1868, 1892, and 1893. The scientists found that the 21st century droughts were indeed extreme, but not as long-lasting or as massive as the worst of the historic ones. 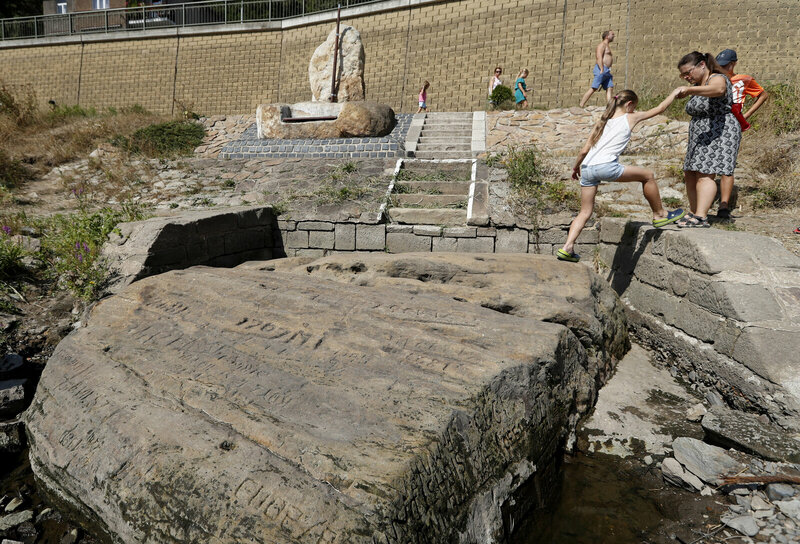 People visit a famous “hunger stone” exposed by the low level of water in the Elbe river in Decin, Czech Republic, on Thursday. Tree rings are magical. 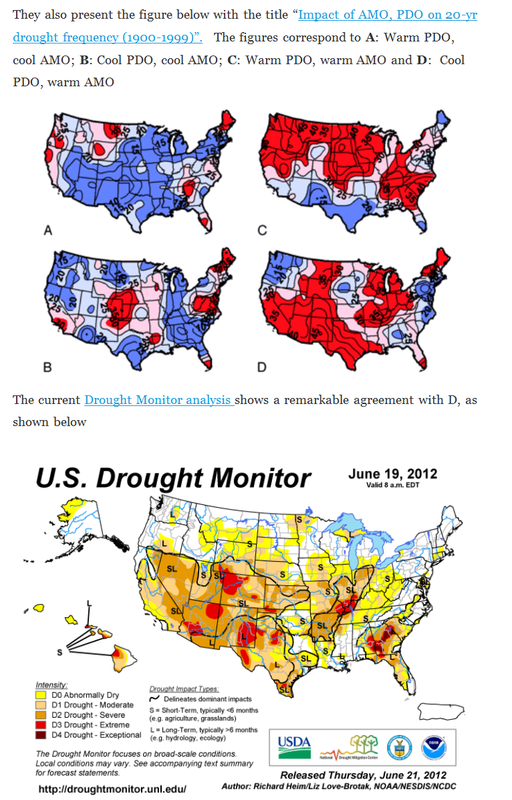 Not only can you reconstruct temperatures from the past, but you can reconstruct droughts (rainfall). Whenever I see the word “novel approach” I worry we are in for BS. However, since the authors of this paper are saying things were worse in the past than present I like to pretend I believe them. They also sort of say that more dendrohydrologists are needed. Surprise. Recent streamflow droughts in south coastal British Columbia have had major socioeconomic and ecological impacts. Increasing drought severity under projected climate change poses serious water management challenges, particularly in the small coastal watersheds that serve as primary water sources for most communities in the region. A 332-year dendrohydrological record of regionalized mean summer streamflow for four watersheds is analyzed to place recent drought magnitudes in a long-term perspective. We present a novel approach for optimizing tree-ring based reconstructions in small watersheds in temperate environments, combining winter snow depth and summer drought sensitive proxies as model predictors. The reconstruction model, estimated by regression of observed flows on Tsuga mertensiana ring-width variables and a tree-ring derived paleorecord of the Palmer Drought Severity Index, explains 64% of the regionalized streamflow variance. The model is particularly accurate at estimating lowest flow events, and provides the strongest annually resolved paleohydrological record in British Columbia. The extended record suggests that since 1658 sixteen natural droughts have occurred that were more extreme than any within the instrumental period. Flow-duration curves show more severe worst-case scenario droughts and a higher probability of those droughts in the long-term reconstruction than in the hydrometric data. Such curves also highlight the value of dendrohydrology for probabilistic drought assessment. Our results suggest current water management strategies based on worst-case scenarios from historical gauge data likely underestimate the potential magnitudes of natural droughts. If the low-flow magnitudes anticipated under climate change co-occur with lowest possible natural flows, streamflow drought severities in small watersheds in south coastal British Columbia could exceed any of those experienced in the past ∼350 years. Predictions that a warmer ­climate will lead to more rain for some but longer droughts for others might be wrong, according to a study of 12 centuries worth of data. The study, published today in science journal Nature, found there was no difference between 20th-century rainfall patterns and those in the pre-­industrial era. The findings are at odds with earlier studies suggesting climate­ change causes dry areas to become drier and wet areas to become wetter. Fredrik Ljungqvist and colleagues at Stockholm University analysed previously published records of rain, drought, tree rings, marine sediment and ice cores, each spanning at least the past millennium across the northern hemisphere. They found that the ninth to 11th and the 20th centuries were comparatively wet and the 12th to 19th centuries were drier, a finding that generally accords with earlier model simulations covering the years 850 to 2005. However, their reconstruction “does not support the tendency in simulations of the 20th century for wet regions to get wetter and dry regions to get drier in a warmer climate”. “Our reconstruction reveals that prominent seesaw patterns of alternating moisture regimes observed in instrumental data across the Mediterranean, western USA and China have operated consistently over the past 12 centuries,” the paper says. But I think Thomas Del Beccaro, writing in Forbes, has a better idea: Let’s fine the board for failing to do its job over the last 40 years. Instead of realizing that “water” was its middle name, the board has been made captive by enviro-Nazis who think people in general are the enemy. Rather than build dams and reservoirs to keep up with a growing population, state government has preferred to depend on the kindness of clouds to provide water for taxpayers. Then the clouds stopped being kind. No Felicia, the dead grass and filthy car are the result of a do-nothing board that should be thrown out on its ear.